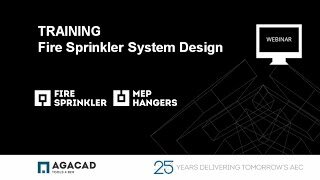 Fire Sprinkler is a powerful BIM solution for wet and dry fire protection systems suited for standards in all global regions. Pre-set or custom rules let you place heads throughout an Autodesk® Revit® model, connect them to distribution pipes based on visually-depicted routing options, pre-calculate pipe diameters, and more. Install or uninstall Fire Sprinkler according to standard procedures. Download the app from the Autodesk App store. Double click the file to start the installation process. You can find E-Help in two ways: press F1 or click the E-Help button on the product main menu. For assistance with Fire Sprinkler, contact our support team at support@agacad.com. We'll get back to you within 24 hours or as soon as possible.